Fleeting Winter Sunshine Brings Everyone Outside! 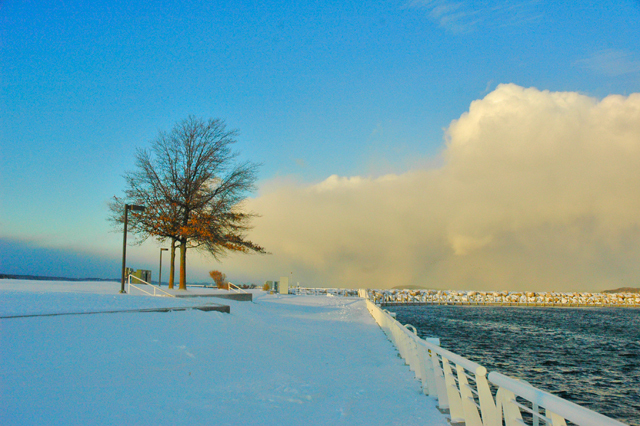 Midwinter sunshine is a precious thing, and here in “lake effect country” it can be especially fleeting. So when that January sun peeks out – especially on a weekend – we tend to drop everything and get outside to play in it. I used to think it was just me, but over the years I’ve learned that the fraternity of winter sun-seekers is a large (if largely secret) one. You’ll get that urge to leave the house and revel in the sunshine as soon as you see the shadows of the trees growing firm and dark on the snow, or notice a few errant scraps of deep, wonderful blue peering through the wind-torn clouds. And as soon as you get out, you discover others who are doing the same thing. Neighbors you haven’t seen since the last sunny day. Complete strangers. Dogs and birds and squirrels by the dozen. All looking friendly, frisky and filled with a modest, grateful happiness – knowing, I suspect, that it won’t be very long before the light fades and the world returns to looking like the inside of an enormous fluffy snowglobe. The phenomenon was especially obvious last Saturday on the Old Mission Peninsula, where hundreds of folks had come for the annual Winter Warm Up tasting/touring event put on by the local wineries. 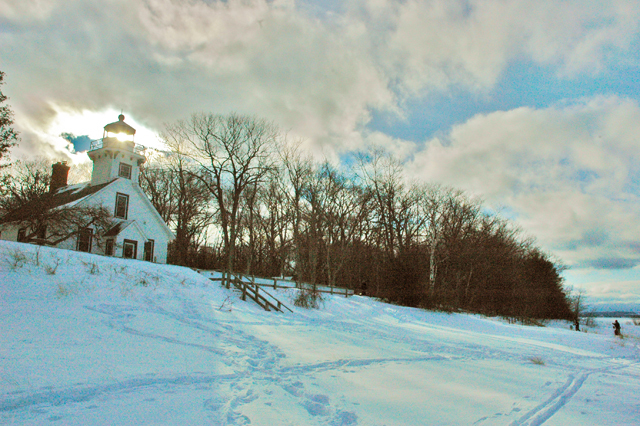 At some point in the afternoon, many of them began following the sun out to the tip of the Peninsula to ski or snowshoe on the trails near the Mission Point Lighthouse, or to simply wander out on the snow-covered shoals north of the point where the shallow water has already frozen and made it safe to explore. Arriving at the lighthouse with my skis, I wasn’t surprised to see the parking lot filled with cars or the groups of explorers emerging from the wooded trails. But I’d never seen so many people out on the ice -- milling around, sitting on boulders, playing tag and frisking about – some of them at the very edge of the water more than a quarter mile from shore. You’d have almost thought someone had organized an excursion, but everyone seemed to have come up with the same idea independently. As it turned out, I had almost waited too long; I could already see a wall of dark cloud moving up from the south, and barely had time to get out onto the shoal myself before the light began to fail and I caught a few dramatic photos of the last brightness shining through the lighthouse tower. No tragedy, of course -- I was going to ski in the forest, where the sunshine would have been wasted on me in any case, and everyone I met on the trail was still smiling as though they were still basking in its rays. I suppose we northerners are a philosophical bunch in wintertime. We take each little miracle the season gives us, and we’re happy with it, knowing that with each day the light grows a little stronger and the days get a little longer. Winter teaches us patience, among other things -- and because we are who we are, we require a long semester of lessons. As a youngster, I couldn’t wait to get away from Michigan winters. I spent several years living in warmer places -- in Florida and in California -- and to my amazement I discovered that I actually missed the rhythms of life in the North. And although I do enjoy getting away from the snow and ice for a week or two when I can, I know that I could never again trade this place for the dubious charms of an eternal springtime. Without winter to spring from, after all, how can spring be spring?